Still loving my apple chips. They are such a great afternoon snack. Bare Fruit is helping me share the opportunity to try Apple Chips with one lucky winner. I am thrilled to share the apple goodness with all of you. Follow the link below and “like” Bare Fruit” on facebook and you are automatically entered to win a case of Apple Chips. Don’t miss out on this giveaway! 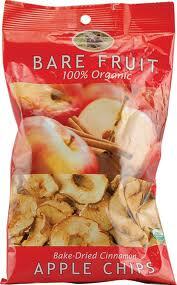 Bare Fruit Apple Chips the healthy organic snack. Follow the link below to enter- it’s that easy! Contest ends Monday, November 5th. This entry was posted in Contests, Family, Food & Snacks, Giveaways and tagged apple chips, Bare Fruit, Bare Fruit Apple Chips, Contest, Giveaways. Bookmark the permalink.